It’s worth noting that on Saturday the 30th of July, fascist street forces attacked the anti-ICE encampment with weapons, passing through a police line as a phalanx to do it, and the police stood by and let it happen. The police acted to protect the fascist Proud Boys, Patriot Prayers, ultra-right Nationalists and Nazi’s and only pushed back against antifascists when it was clear that our side was winning. Check out IDGcast #15 for Rose City Antifa talking about prep to resist the fash in Portland and keep an ear out for reportbacks on that medium and their website. Also, this good writeup available at crimethinc.com. Keep safe out there, wherever you are, and remember that the cops and Klan go hand in hand. 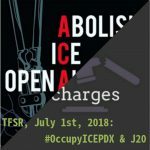 Here’s a fundraiser for costs and charges related to resisting Patriot Prayer on June 30th. Several weeks ago, friends and supporters of incarcerated freedom fighter Comrade Malik Washington were overjoyed to hear that he was getting released, finally, from Administrative Segregation (solitary confinement) at Eastham Unit in Texas–until TDCJ (Texas Department of Criminal Justice) pulled a fast one, falsely claiming that Malik refused the Ad-Seg Transition Program to get him released from solitary back to general population. Here’s what actually happened: Malik arrived his new unit, Ramsey I, on June 21, only to discover that he was being assigned to a top bunk, which is prohibited by his medical restrictions as a seizure patient. Then it got worse: TDCJ had failed to transfer his medical restrictions records, or had erased them, and were now claiming no record of these restrictions, which have been on file and in place for the past ten years. Malik wrote a detailed statement requesting to be placed on a lower bunk in order to avoid injury; later that night, he was abruptly transferred out of Ramsey, and was told that staff there said he refused the transition program! Malik’s supporters are extremely concerned for his safety, and we urgently need the help of everyone hearing or reading this! 1. Please write to Malik at his new address — every letter he receives tells prison staff that Malik has people looking out for him, which is important protection. 2. Call Senior Warden Phillip Sifuentes at Malik’s current facility (McConnell) and tell them Keith Washington (#1487958) should not be in Ad-Seg! Hello, I’m calling because I’m concerned about Keith H. Washington (#1487958) who was recently transferred to your facility. I understand he was transferred there from Ramsey Unit, because he supposedly refused to participate in the transition program there, but this is not the case. He never refused to be part of the program, and he needs to be transferred back to Ramsey and admitted to the transition program immediately!